Place our adorable plush doggie on a drafty windowsill or doorway and keep the heat in and the cold air out. 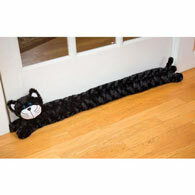 The pup's 33" long body will block out winter winds and help keep your home comfortable and warm. Embellished with button eyes, felt nose, floppy ears and a very cute smile. Made of polyester with polyfill.